Hi from Designer Chris! 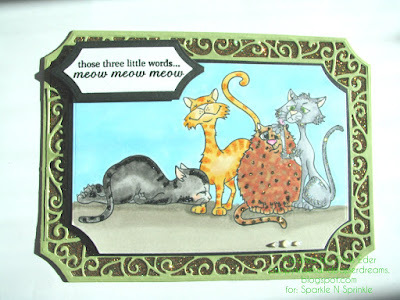 Today's card is using Sparkle N Sprinkle's new Cat's Meow stamp set. These sweet, sassy stamps are the cutest! Let's check out today's card. I started out by trimming some cardstock with my Tonic Studio 12" Wide Base Guillotine trimmer, and started by stamping the kitty laying down, on the left. I masked him off, and then stamped the kitty on the far right (I had already sized out how far I had to put the kitties apart so they could all be together), and masked him off too. 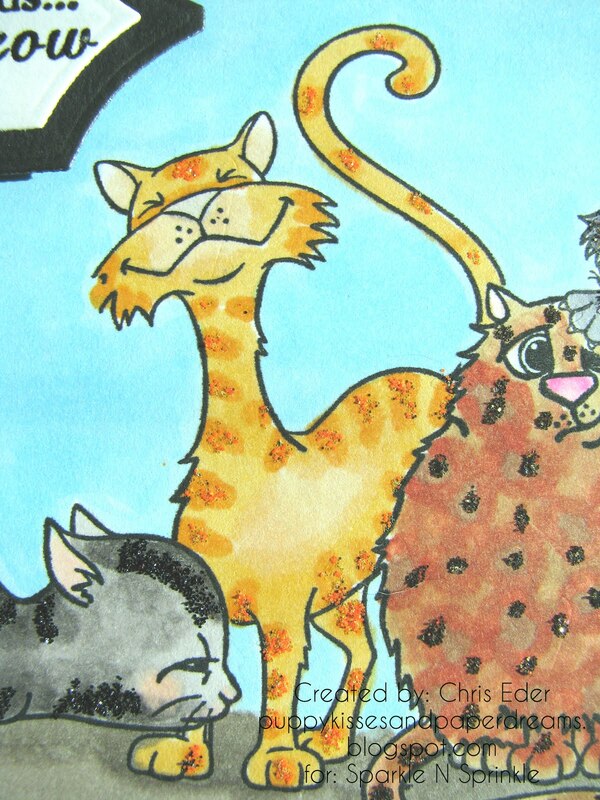 I then stamped the squatty chubby kitty, masked him, and then stamped the smiley standing cat in the background. 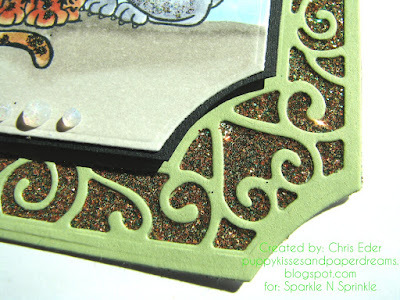 I used Tonic Studio's Tim Holtz Stamp Platform for all this stamping, which made the stamping really easy! Sometimes I find I need to stamp twice to get a good impression when I am stamping over a mask. Ya gotta make sure the edges stamp nice and crisp! After stamping all the kitties, I colored them with Copic markers. Then, I whipped out my Sakura Glue Pen and rolled on adhesive in strategic spots. I added some glitters: Creamsicle on the orange striped kitty, Black Ice for the dark gray kitty, and Chameleon for the chubby tubby. I also used Surf glitter on the light gray kitty! 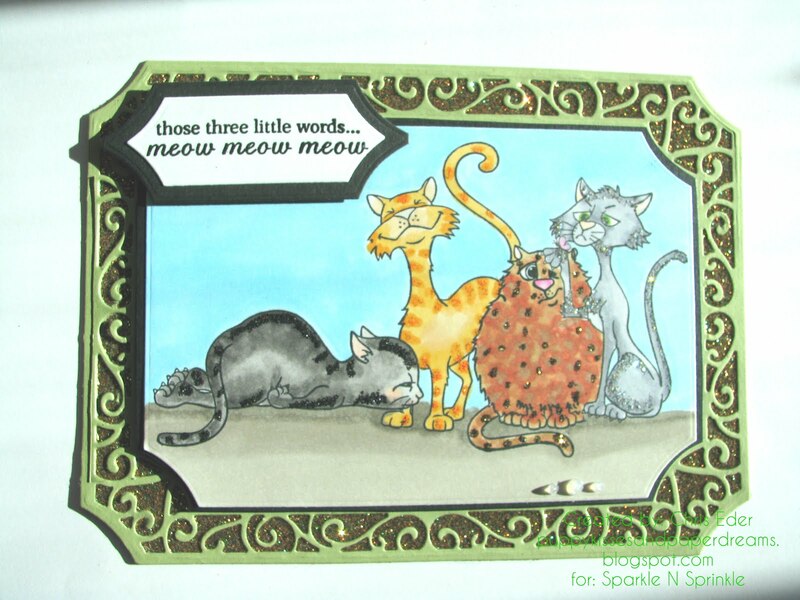 I die cut the stamped image with the Swirling Frame Layering Die Set, and created a larger layer using the same die on green cardstock. I adhered 3/4" Tear-ific Tape to the back of the negative spaces on the outer edges, and then burnished in Fall Leaves glitter to add some more sparkle! 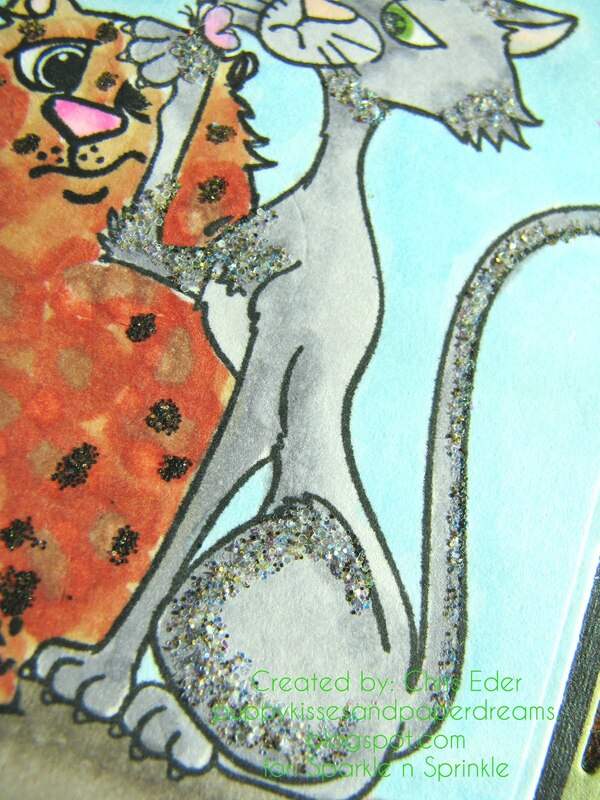 I also squeezed on some White Blizzard Glitter Drops to the edge of the kitty image too! I also stamped out the sentiment, using Versafine Black Onyx ink, and the sprinkled on Clear Detail embossing powder and heat set it. 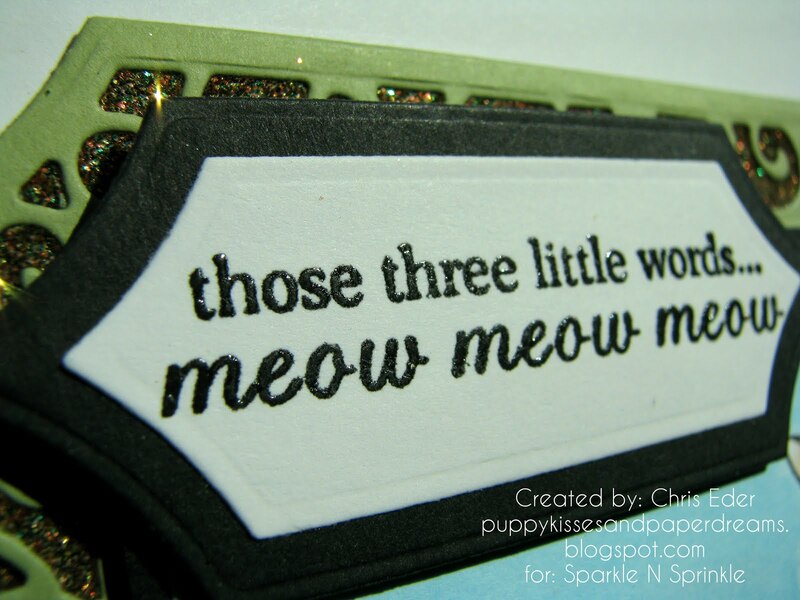 I die cut the sentiment using the same Swirling Frame Layering Die Set, and used the next larger die to create a bit of a matting for the sentiment. I adhered it on foam tape and adhered it to the card. These kitties crack me up and they are so funny and sassy! The perfect kitty attitude is captured with these sweet kitties! I can't wait to see what you create with them! Remember to post your creations in the Sparkle N Sprinkle Creative Challenge on Facebook. I'll see ya there!